Pre-show activities begin at 7pm. Movies begin at dusk. 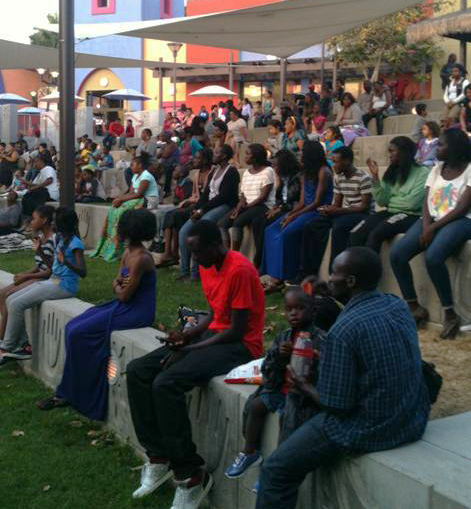 Free Summer Fun – Friday Family Movies a Huge Success!! “How to train your dragon”. 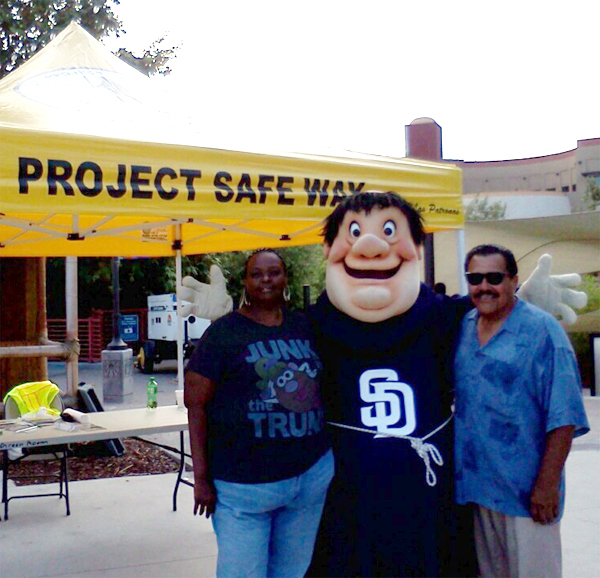 San Diego Padres “Pad Squad” and The Friar had fun with kids. Lefaua’s Samoan Dance group turned up the heat. A Better Life – A gardener in East L.A. struggles to keep his son away from gangs and immigration agents while trying to give his son the opportunities he never had. The Jacobs Center for Neighborhood Innovation’s Youth Movement would like to extend an invitation to any interested youth to participate in the following events that are designed for students to gain valuable leadership, team building, and critical thinking skills, which will benefit them personally, professionally and academically. Below is a brief overview of the three projects being coordinated by the Youth Movement interns. 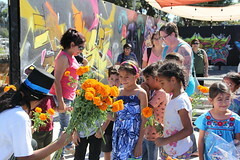 A series of once a month outdoor activities, that focus on cultivating leadership, raising awareness around community building and environmental concerns. This series includes trips to Julian, Mission Trails, Sunset Cliffs, rock climbing and a ropes course. A 15 week long workshop series with Media Arts Center designed for youth to create digital stories and short documentary films centered around the themes: “Who I Am” and “Where I Am From”. The workshops series will culminate in a youth film festival on June 22nd. A five month long movie night series for high school and college age youth. There will be dinner and a movie followed by an interactive discussion. The purpose of the event is to help youth connect while providing a space to help them think critically about the images and messages present in the films they watch. If you haven’t already checked out what SDAFF is offering at its 11th annual film festival, there’s still two days of comedies, dramas, shorts, animation, and documentaries by Asian and Asian-American filmmakers to explore at the UltraStar Mission Valley Cinemas. Tonight’s line-up includes animation shorts by artists around the world, a documentary on the lingering aftereffects of the bombings on Hiroshima and Nagasaki survivors, not one but two(!) showings of Donnie Yen’s turn in Ip Man 2 (a must see for martial arts enthusiasts), and a screening with the filmmaker of the Philippine indie drama The Mountain Thief. The festival closes on Thursday with a line-up that includes a documentary on adoption and South Korea, a family drama from Japan and South Korea, a shorts program focused on Asian-American experiences in New York City, a comedy-romance from Vietnam, and two screening of the closing night film Au Revoir Taipei, a Taiwanese indie romance set in France. Tickets to these screenings can be purchased at the UltraStar Mission Valley box office. Ticket holders and festival pass holders can also attend Thursday’s closing night party at the Randy Jones All American Grill in Hazard Center with complimentary food, silent auction, and raffles. For more info about the festival, screenings, and showtimes, visit SDAFF’s festival page. You can also find the festival across the web on Twitter (@sdaff, @sdaffowls), Facebook, and YouTube. Looking for something to do this first weekend of fall? Here’s some of our picks for arts and culture events taking place in southeastern San Diego and around town. The San Diego Asian Film Foundation is hosting a free outdoor screening of The Real Shaolin at Market Creek. Besides seeing a great film (which our staff can’t recommend enough), you’ll get to meet some of the wonderful folks behind one of San Diego’s premier film festivals. More info on the screening can be found in our previous post. For more info on the foundation and its upcoming festival, check them out across the web: SDAFF website, Facebook, Twitter, and YouTube channel. To purchase tickets, visit the The Old Globe or call (619) 23-GLOBE (234-5623). 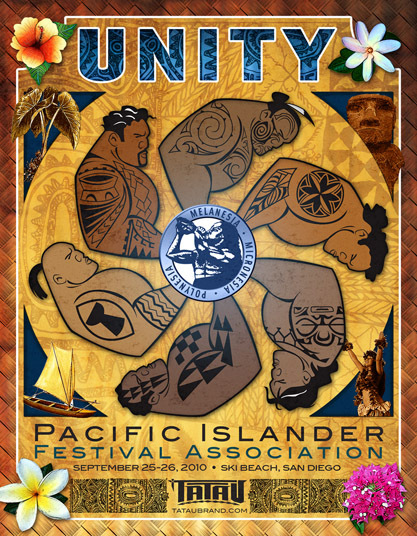 The 16th annual Pacific Islander Festival Association (PIFA) event takes place this Saturday and Sunday in Mission Bay. Experience music, dance, merchants, food, and more representing cultures from throughout the islands of Melanesia, Micronesia, and Polynesia. Free admission. Parking is $10 per vehicle; free shuttles are provided from designated lots to the event site. For more info on PIFA, visit their website. The San Diego Asian Film Foundation is hosting its annual outdoor screening at Market Creek Plaza on Friday, September 24! The Real Shaolin (2008) is a documentary by Alexander Sebastien Lee that follows the lives of four martial arts students from China, France, and the United States as they master their Kung Fu skills at the Shaolin Temple. In the mountains of Central China, the Shaolin Temple is known as the legendary birthplace of Kung Fu and Zen Buddhism. The Shaolin monks are real-life superheroes who created a paradox by combining deadly martial arts techniques with daily meditation to achieve enlightenment. The Real Shaolin is a documentary about two Chinese and two Westerners who journey to Shaolin inspired by the legends portrayed in Kung Fu movies. They discover a temple shrouded in secrecy, a culture isolated from the West, and the power of the human spirit. Through their trials, all learn that despite their single-minded focus, only a select few attain the physical and spiritual perfection of the legendary Shaolin monks. Each discovers that enlightenment is not embodied by a single place but through a long journey that begins and ends in one’s heart. The event is FREE and plenty of parking is available next to the venue. 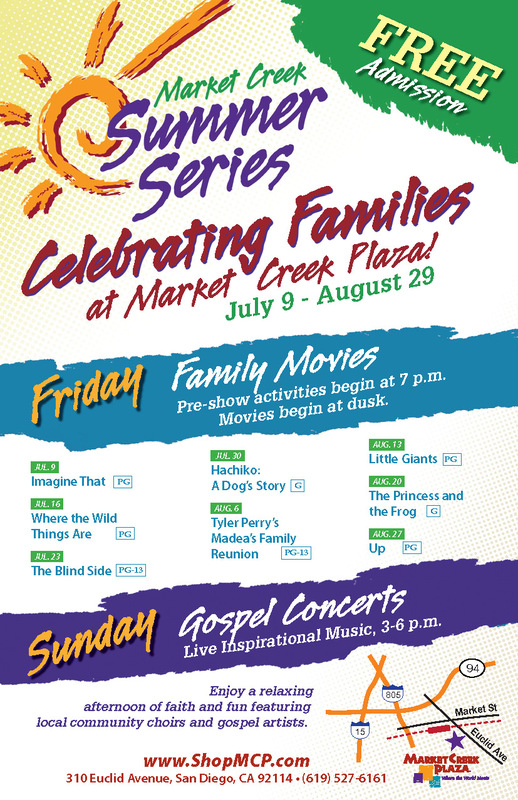 There are only two more weeks left in the Celebrating Families Summer Series at Market Creek Plaza — be sure to bring the family for a weekend of good movies and inspiring music! This week’s movie is Disney’s The Princess and the Frog (2009). This animated tale follows the adventures of Tiana and Prince Naveen as they seek a remedy to the spell that has turned them into frogs. 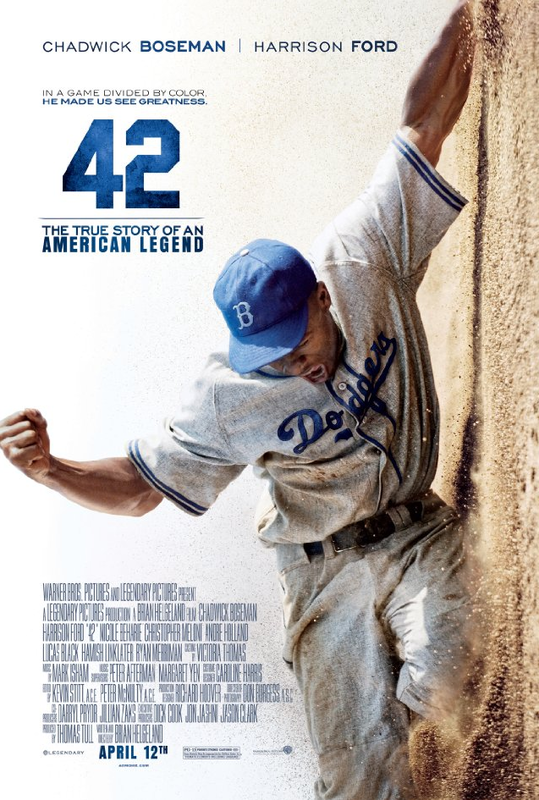 Rated G. Pre-movie activities begin at 7pm; the movie starts at dusk in the amphitheater. Every week, this afternoon concert features performances by local choirs and choral groups singing a variety of traditional and contemporary gospel. 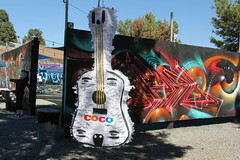 The concert is from 3 – 6pm in the amphitheater. Admission to the series is free and parking is available adjacent to the venue. For more information, call 619-527-6161. 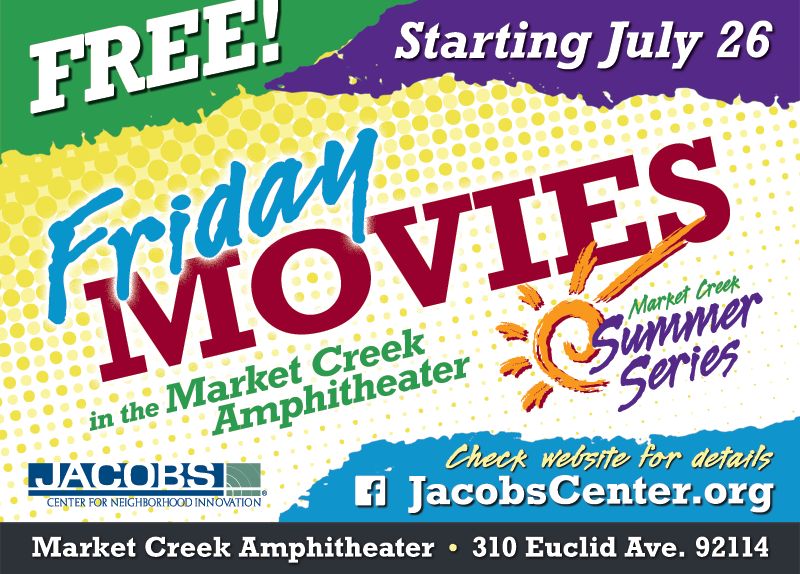 The Celebrating Families Summer Series at Market Creek continues this weekend with a family-friendly movie and gospel performances you don’t want to miss! This week’s movie is Little Giants (1994), a comedy about a pair of brothers who coach rival Pee Wee football teams. Starring Rick Moranis and Ed O’Neill. Rated PG. Pre-movie activities begin at 7:00pm. The movie begins at dusk. Island Gospel is the theme for this week’s concert, which features local youth and adult choirs and choral groups. Performances are from 3:00-6:00pm in the amphitheater. Admission to Summer Series events is FREE! Bring your family and friends for a relaxing evening or afternoon out. The Market Creek Plaza amphitheater is located at 310 Euclid Avenue, next to Food 4 Less and the Euclid Avenue Trolley Station. For more information about these events, please call 619-527-6161.